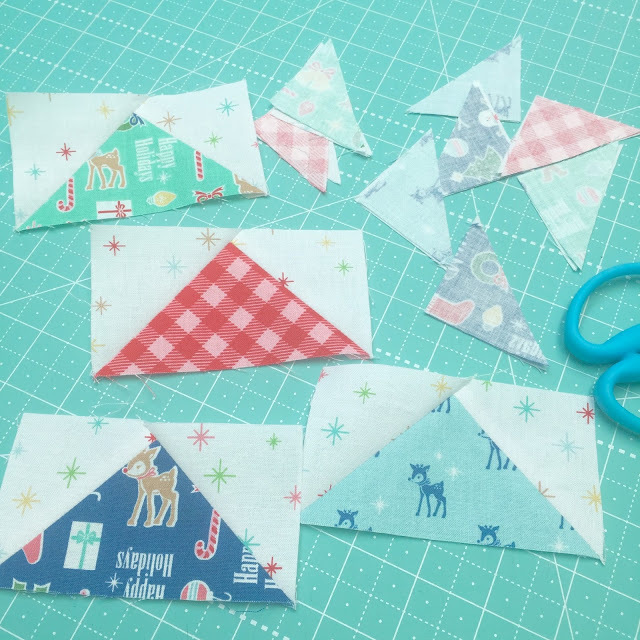 Bee In My Bonnet: Cozy Christmas Sew Along - Week One - Block One! 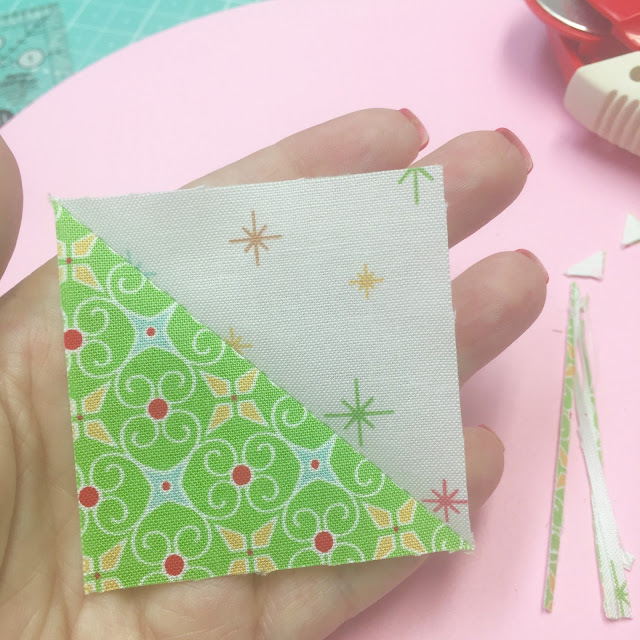 Cozy Christmas Sew Along - Week One - Block One! 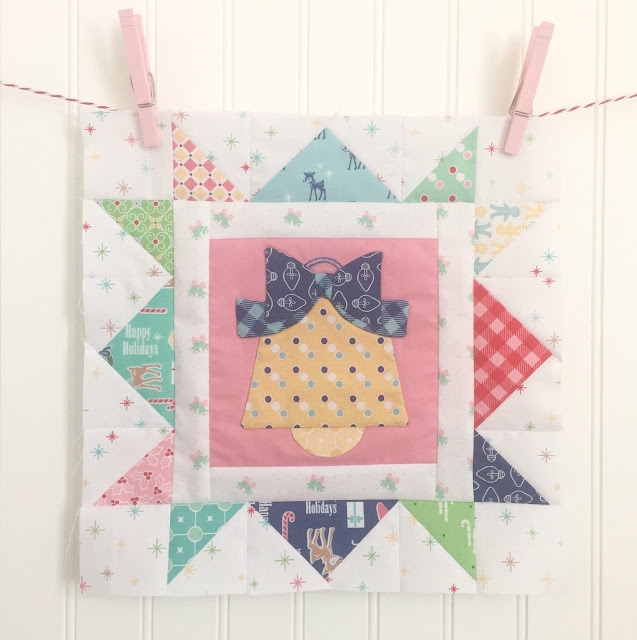 the sew along with Block One! 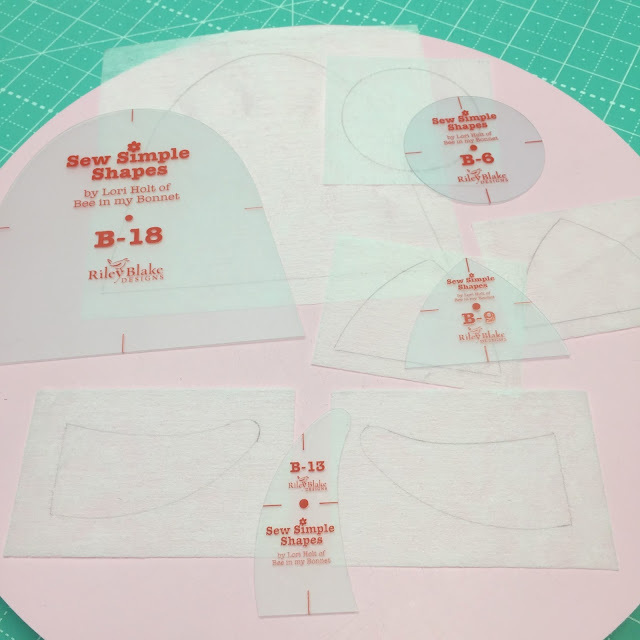 will be using for the appliqué shapes. weave to make it more sturdy. if you want to try it! 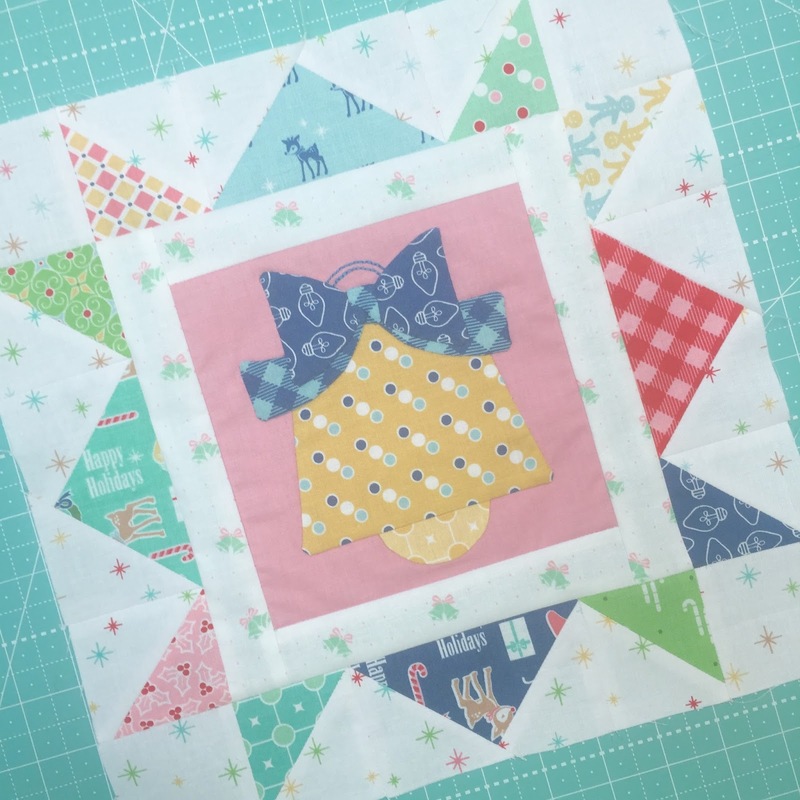 I chose to hand appliqué mine. machine appliqué if you want. I thought 6 strands looked best. 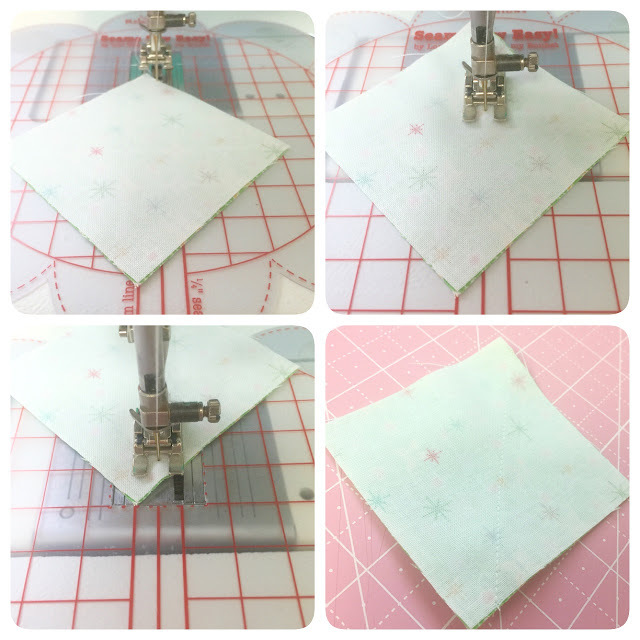 on how to do a back stitch. PRESS your block from the back. This protects the appliqué work on the front. and trim your block to 6 1/2" square. inner borders around your block. for this are in your pattern. 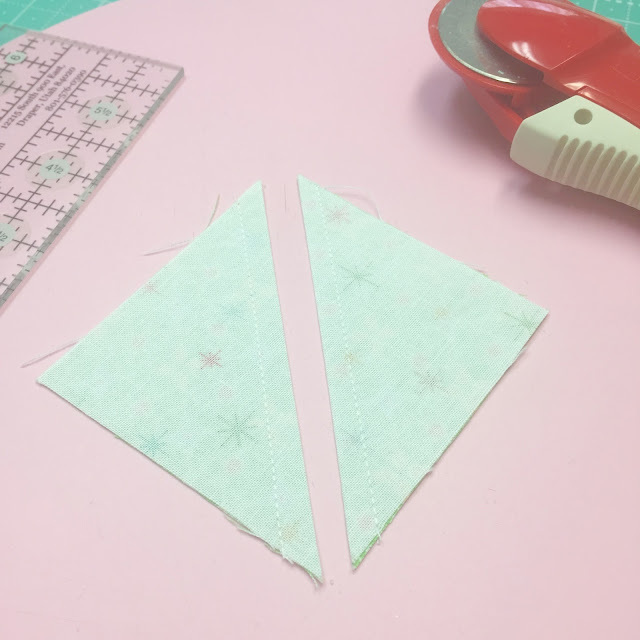 I cut my little mint and pink bell background fabric. pieced outer borders on your block. I will show you how with close up photos. 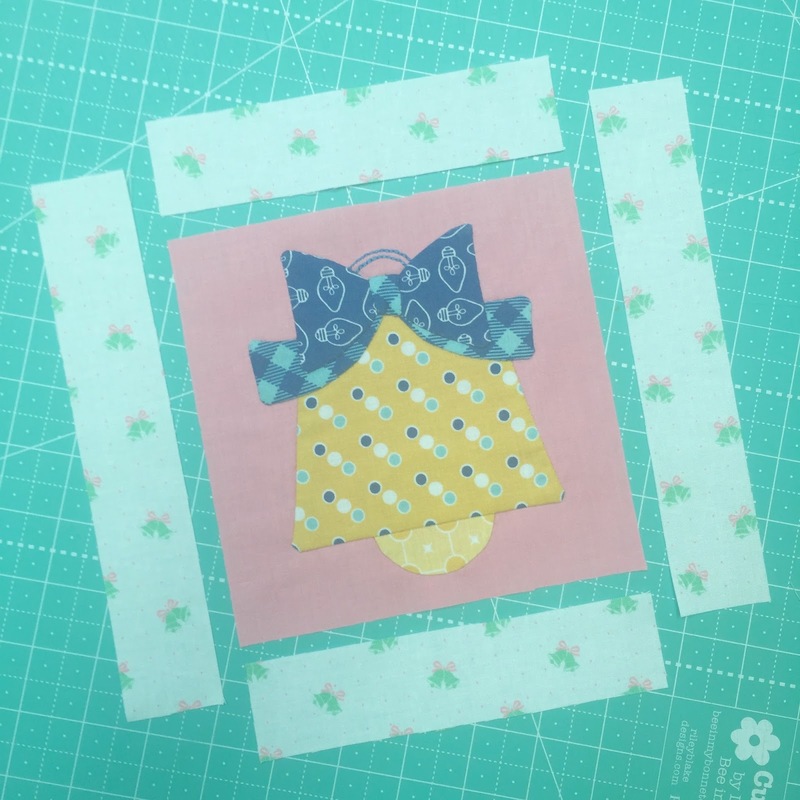 one side of the rectangle with right sides together. from stitching line and press open. 3. Repeat for the other side. 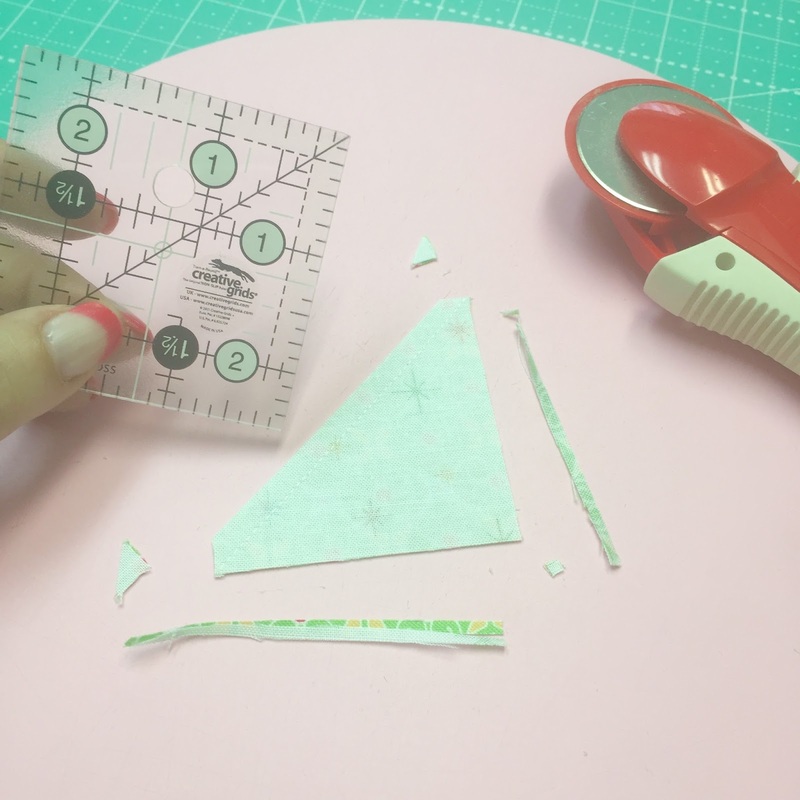 this method is super easy! at the same time using this easy method. of the background and a print to make 2. You simply put them Right Sides Together and sew 1/4" on each side of the diagonal center. 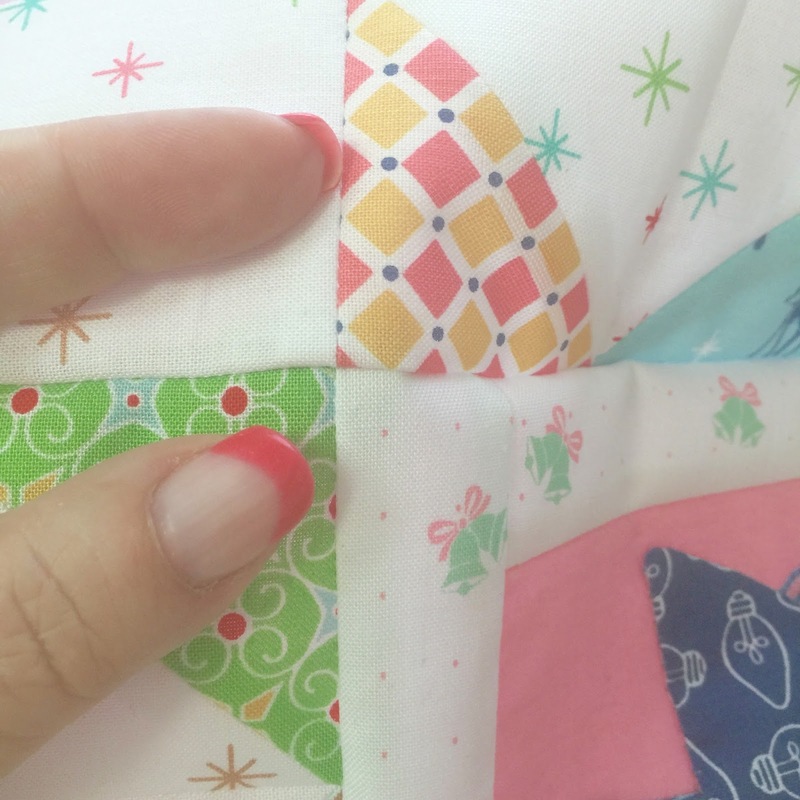 I did not mark a line down the center of mine because I used my Seams Sew Easy. 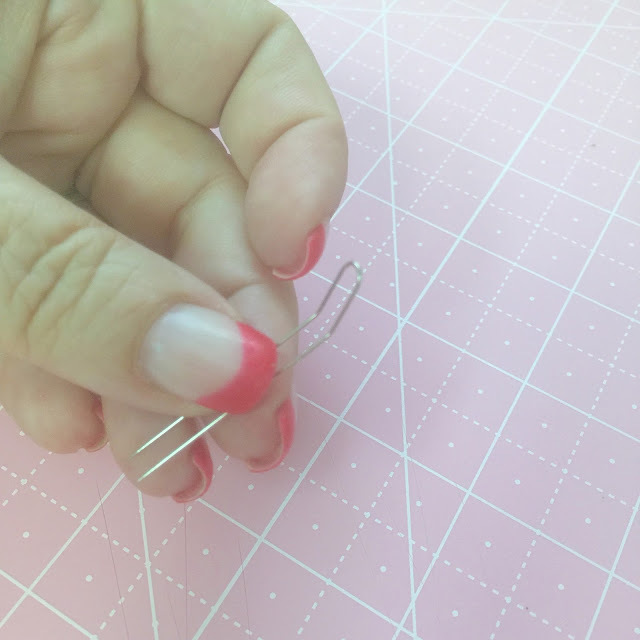 You can see in this 4 step photo above how I sew the first seam by using the left line on my Seams Sew Easy as a guide. It's simple because the 3 lines are exactly 1/4" apart. 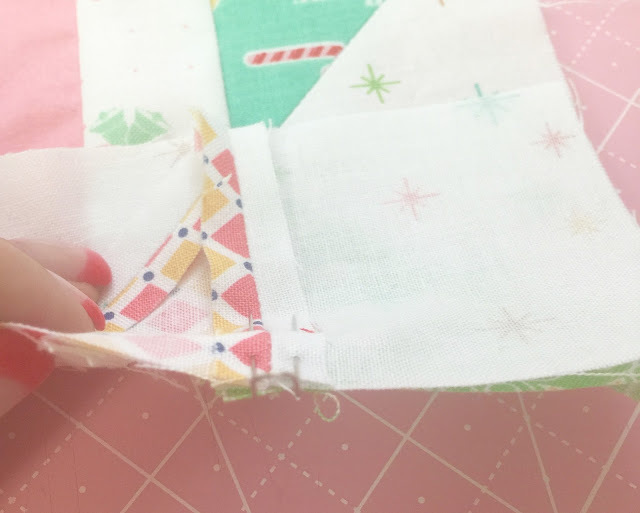 For the other seam I simply do the same thing on the other side. but don't press them open yet! I like to square mine up BEFORE I press them open to save time on the trimming step. Use a 2 1/2" square ruler and place the diagonal linen my stitching line like this. Then I trim off the excess. 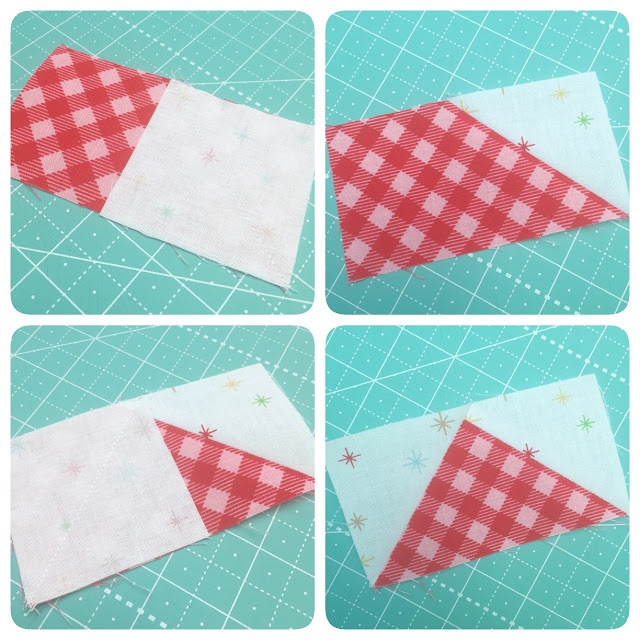 2 1/2" half square triangle. 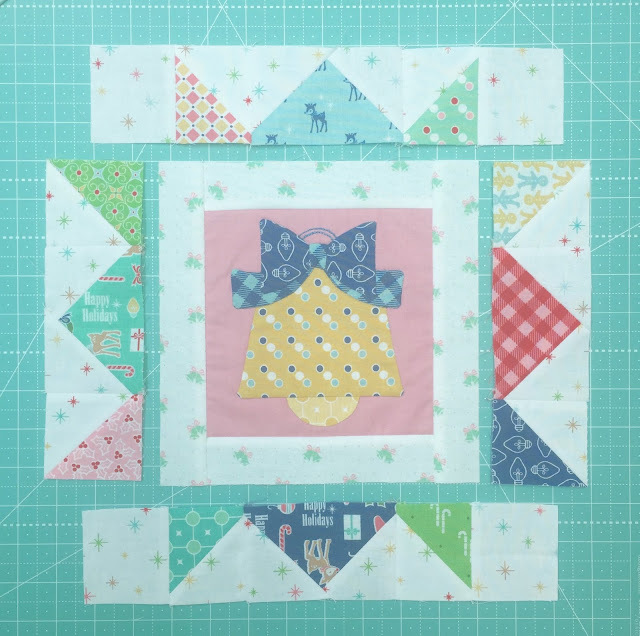 another block in this quilt. 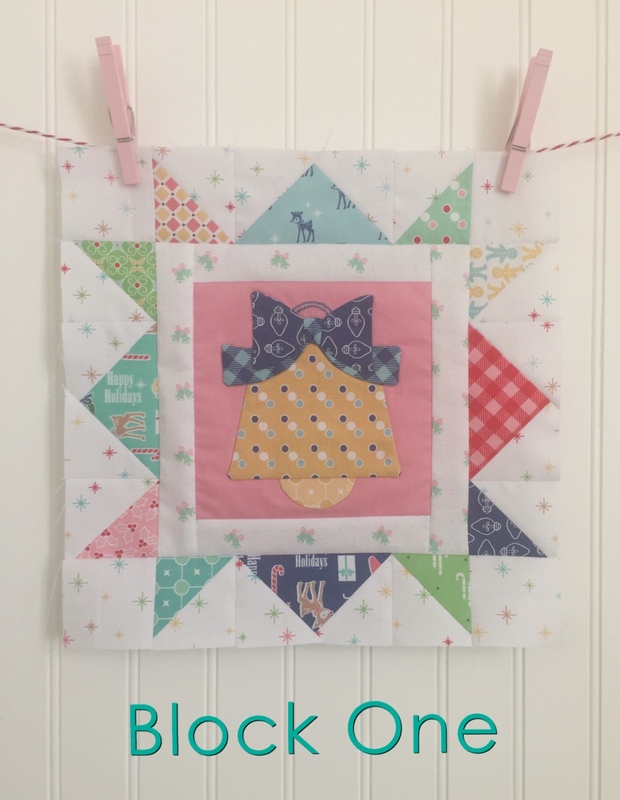 Now stitch your block one together! 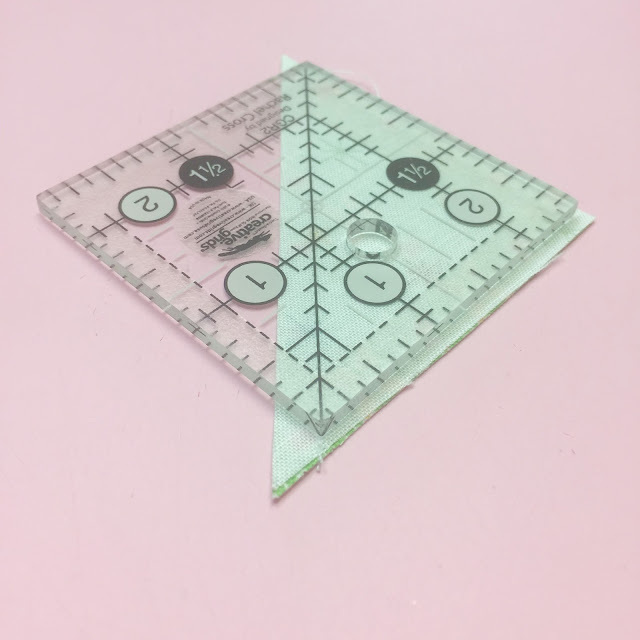 12 1/2" square at this point. to trim up if needed. I like to use a fork pin by Clover. I use it because I can pin on BOTH sides of the seam at the same time and that leaves no room for either side to slip out of place when going under the presser foot. that we have finally started! I can't wait to see your block one. Wonderful start to my Monday!! Always love your tutorials! 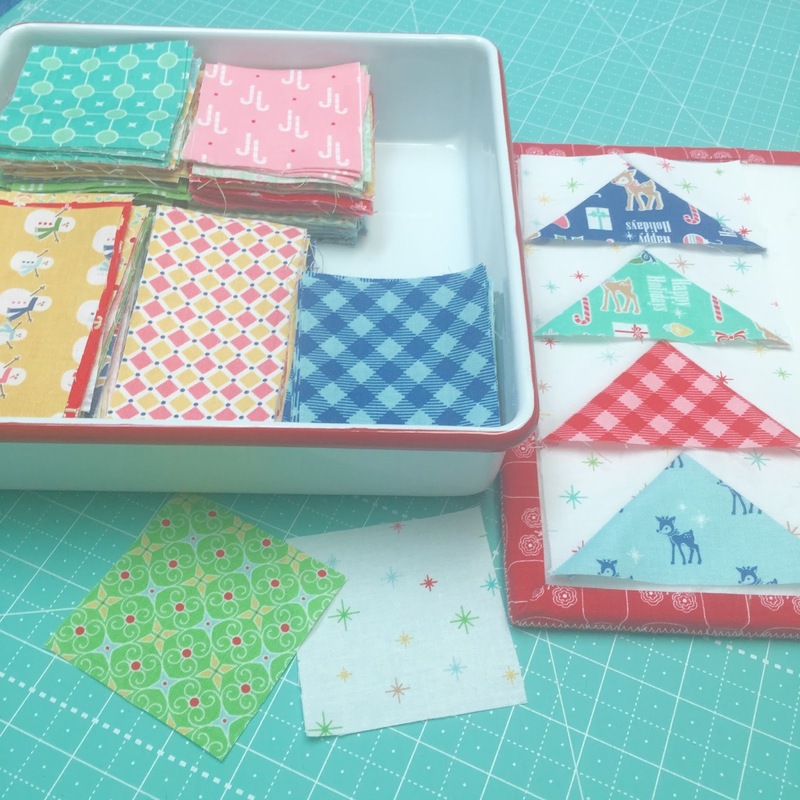 I'll be choosing all my fabric today from your sweet Cozy Christmas Line - my templates should be arriving soon :)! Looking forward to sewing along :)! We're finally starting....hope I can keep up! So cute! 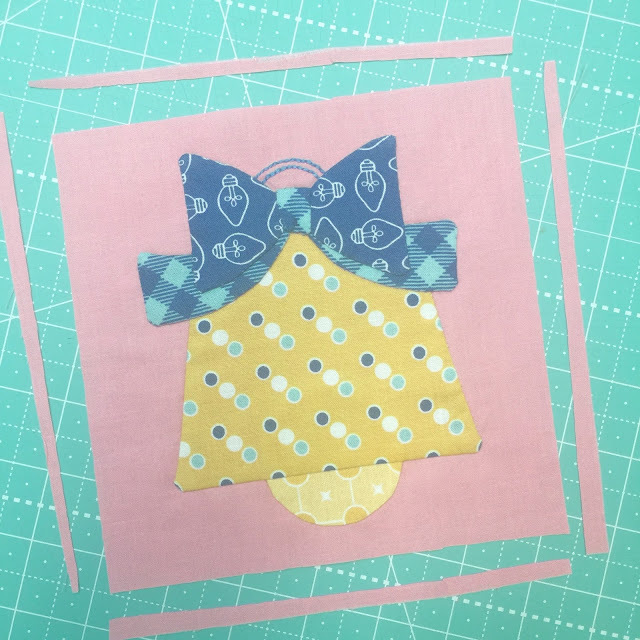 I have not been able to master the hand applique for years. I am never happy with my results. Well, I love Lori's patterns and this has been a dilemma for me. I decided I was going to tackle this once and for all. I watched Lori's tutorials and BAM! Nailed it!! Lori, thank you so much, I was just doing a few things wrong and when I followed your instructions my stitches were very smooth and my lines nice and straight. 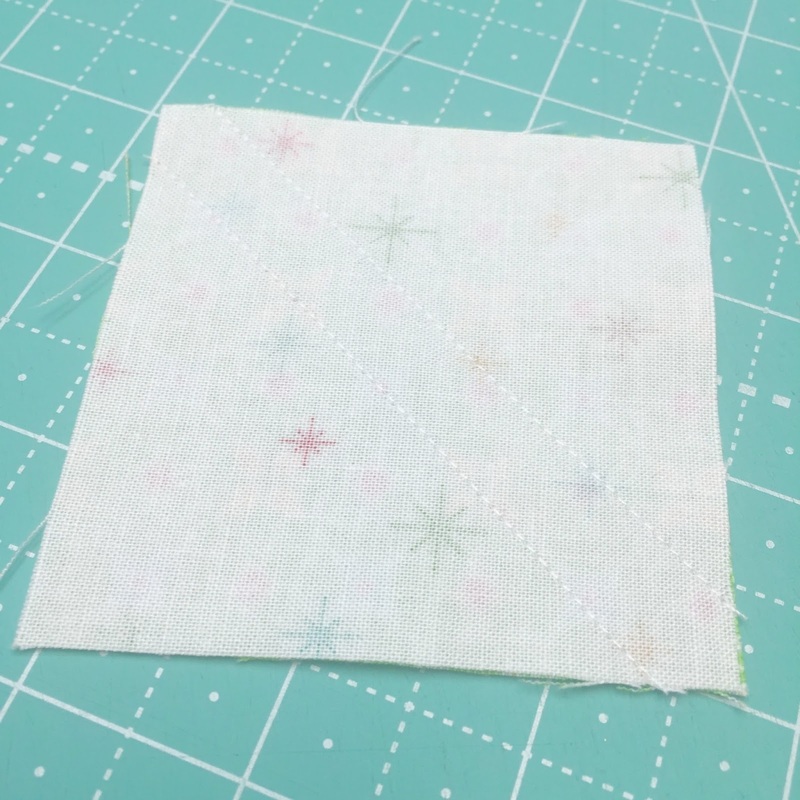 Now with practice, I hope to get the stitch length consistent! I am just seeing all this now...and love it!! 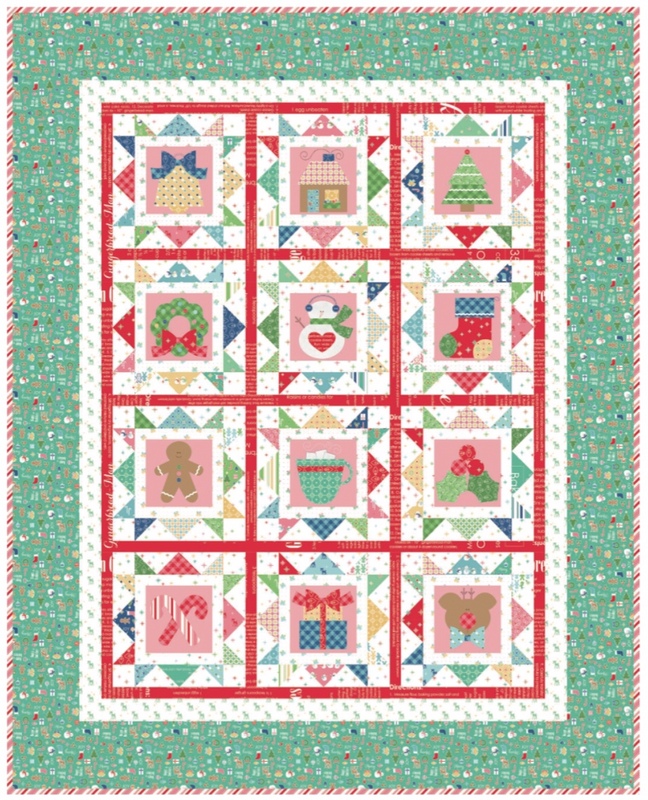 Where do I get the pattern for the Cozy Christmas quilt? I tried the Fat Quaarter Shop, but did not see it there. Thanks!! 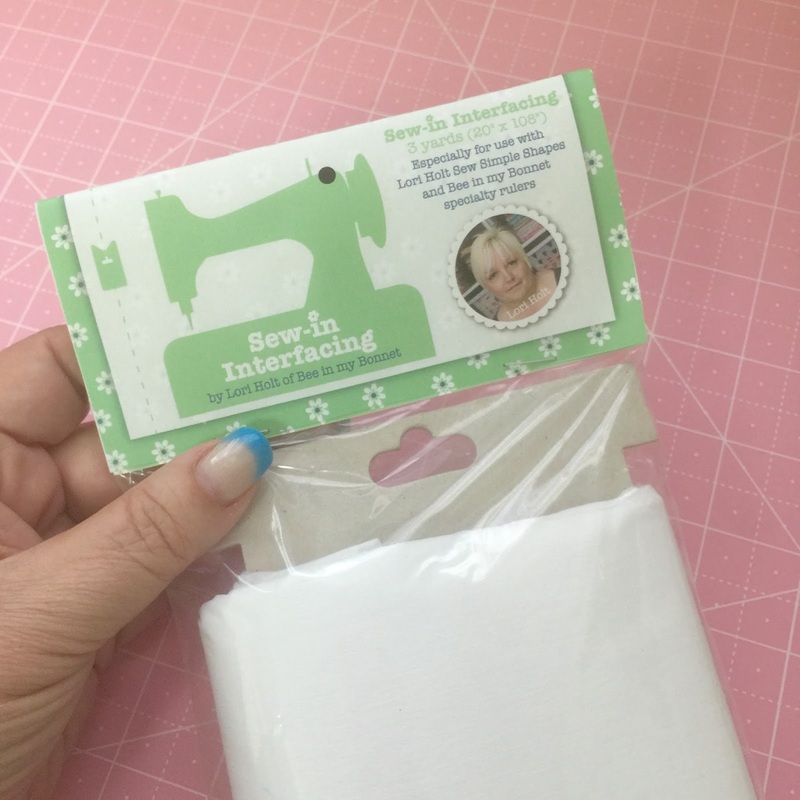 As always, I am so excited for your sew-a-longs!! The fabric is just so darn adorable!! 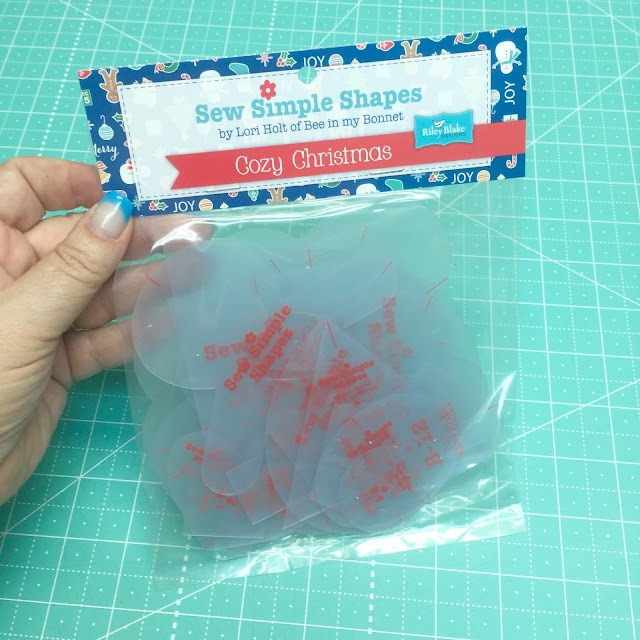 I love, love, love your sew together bag in your Cozy Christmas fabric!! 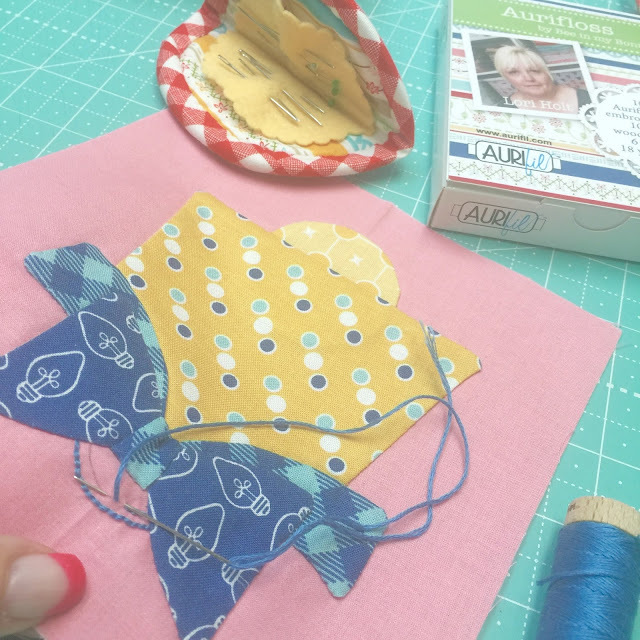 I am having so much fun just cutting out the fabric because your fabric patterns and colors make me happy!! Take care and have fun on your trailer!! 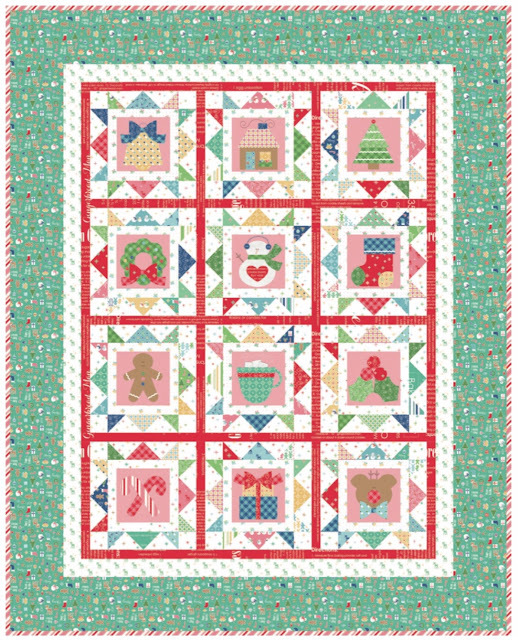 love the Christmas pattern, can't wait to catch up with you. 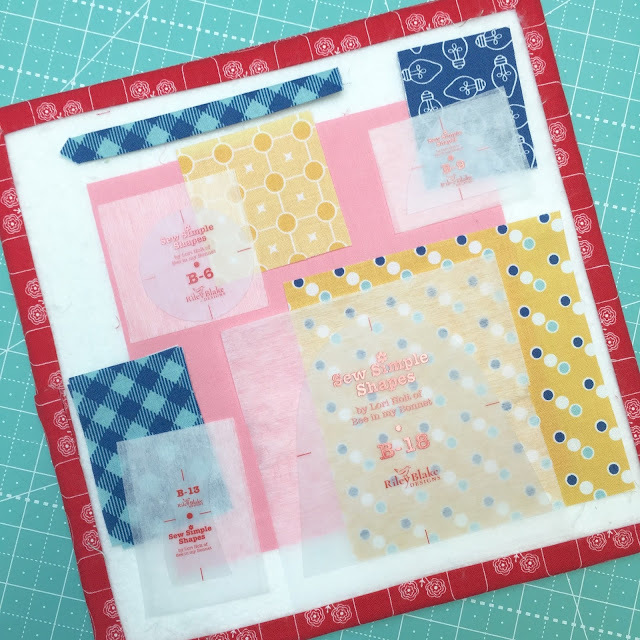 Do you have a pattern for your little bag that holds your templates as in Block Three? Love the size. 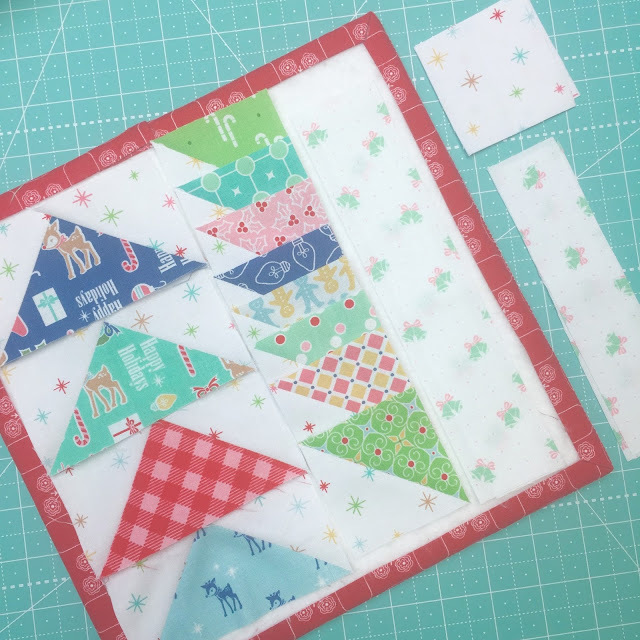 Cozy Christmas Sew Along - Week Two - Block Two!! 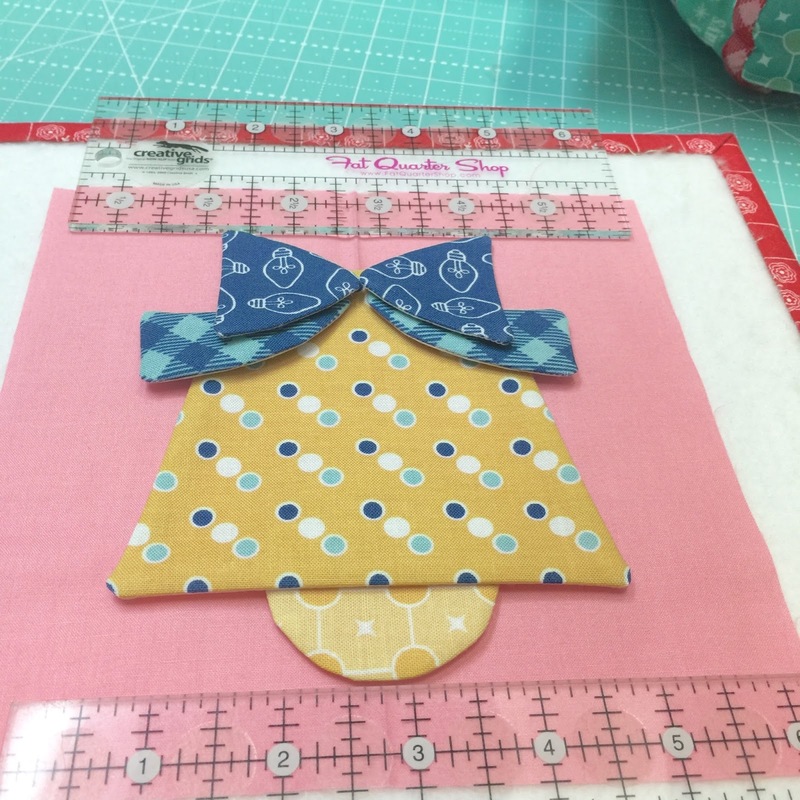 Scrappy Project Planner - Bee Organized!! !